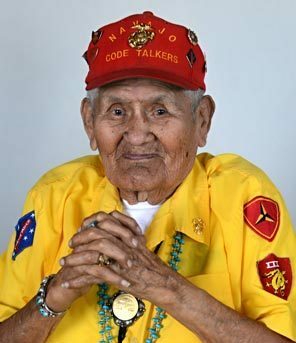 FLAGSTAFF, Ariz. —The last of the 29 Navajos who developed a code that stumped the Japanese during World War II has died. Navajo Code Talker Chester Nez in 2011 at his home in Albuquerque. Nez, the last of the 29 Navajos who developed an unbreakable code that helped win World War II, died Wednesday morning. He was 93. Nez was in the 10th grade when a Marine recruiter went to the Navajo reservation looking for young men who were fluent in Navajo and English. Nez told The Associated Press in a 2010 interview that he kept the decision to enlist a secret from his family and lied about his age. Nez has said he was concerned the code wouldn’t work. At the time, few non-Navajos spoke the language. Even Navajos who did couldn’t understand the code. It proved impenetrable. “The Japanese did everything in their power to break the code but they never did,” Nez said in 2010. Nez was eager to tell his family about his role as a Code Talker, Avila said, but he couldn’t. The mission wasn’t declassified until 1968. Nez threw the opening pitch at a 2004 Major League Baseball game and offered a blessing for the presidential campaign of John Kerry. In 2012, he received a bachelor’s degree from the University of Kansas, where he abandoned his studies in fine arts after money from his GI Bill ran out. This entry was posted in News and tagged Chester Nez, Navajo Code Talker by admin. Bookmark the permalink.